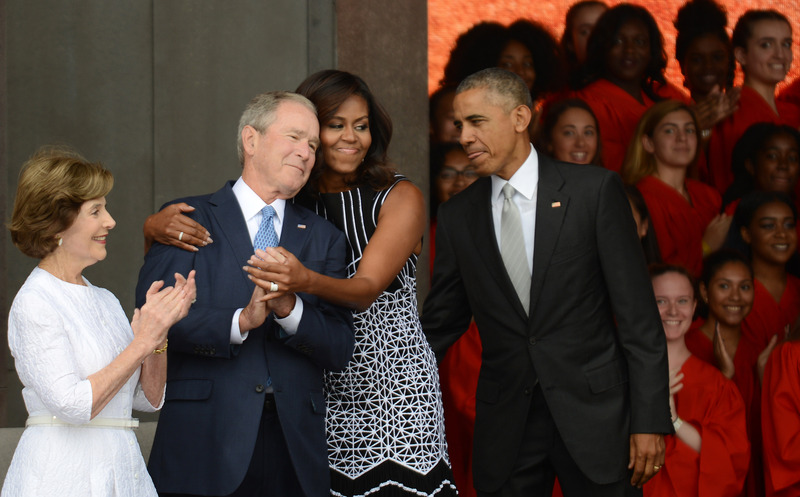 At Saturday's opening of the National Museum of African American History and Culture, Michelle Obama gave George W. Bush a warm hug. He appeared to enjoy the embrace, and, once the image of the moment between the two hit social media, internet users joined in on the good times. Some simply expressed how moved they were by the display, with one person calling it their, "...favorite little moment today..."
Others used it as an opportunity to flex their photo-editing skills. Numerous altered versions of the shot surfaced on Reddit. Among them is an image in which Bush is wearing Batman pajamas. Others show him as a baby, a Sailor Moon body pillow, and, of course, the sort of bush one finds in nature. There were those who got rid of the former president entirely, replacing him with Donald Trump, Brad Pitt, and Michelle Obama herself.